Yesterday I entered the chook pen to feed the birds, only to find a small yellow and black lifeless body in the sand. But unfortnately I was too late. We had been waiting for the ducklings to hatch, guessing that it was around 5 weeks- the ducks seem to have been nesting for ages now. So turning to a distressed mum (as I conviscated her lifeless baby) I noticed a second lying closer to the nest. This posed more of a fight, as I had to contend with both mum and dad. But it was worth it... this one, though cold, was just about breathing. So I put it down my top and rushed it to the house. When inside I dunked its beak in water- which swilled out alot of sand and dust. I dare say the little thing would have suffocated, before too long. Once it had drank, I placed it and the container lid full of water in the inucbator. I'm happy to say this little one made it out to the brooder baox last night. But I am now watching the ducks and their nests very carefully. I managed to steal these two hatching eggs from her this morning- she was not happy with me. But I could not let them hatch whilst I was at work, just in case. So these are currently in the incubator- hopefully hatching and drying safely! Great news! All 3 ducklings are doing really well. But even better, when I went o check on Mum, she was accompanied by 4 healthy and fluffy ducklings! 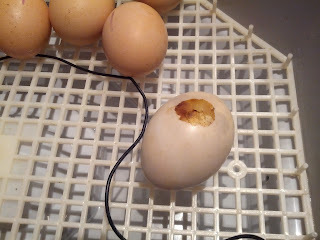 So the rest had hatched successfully and are doing well. I'll get some photos as soon as I can... they are gorgeous!